Definition at line 119 of file llviewerparcelmgr.h. Definition at line 114 of file llviewerparcelmgr.cpp. References LLViewerImageList::getImage(), LLControlGroup::getString(), gImageList, gViewerArt, i, mAgentParcel, mAgentParcelOverlay, mBlockedImage, mBlockedImageID, mCollisionParcel, mCollisionSegments, mCurrentParcel, mCurrentParcelSelection, mFloatingParcelSelection, mHighlightSegments, mHoverParcel, mParcelsPerEdge, mPassImage, mPassImageID, PARCEL_GRID_STEP_METERS, PARCEL_OVERLAY_CHUNKS, REGION_WIDTH_METERS, resetSegments(), S32, LLUUID::set(), sPackedOverlay, and TRUE. Definition at line 160 of file llviewerparcelmgr.cpp. 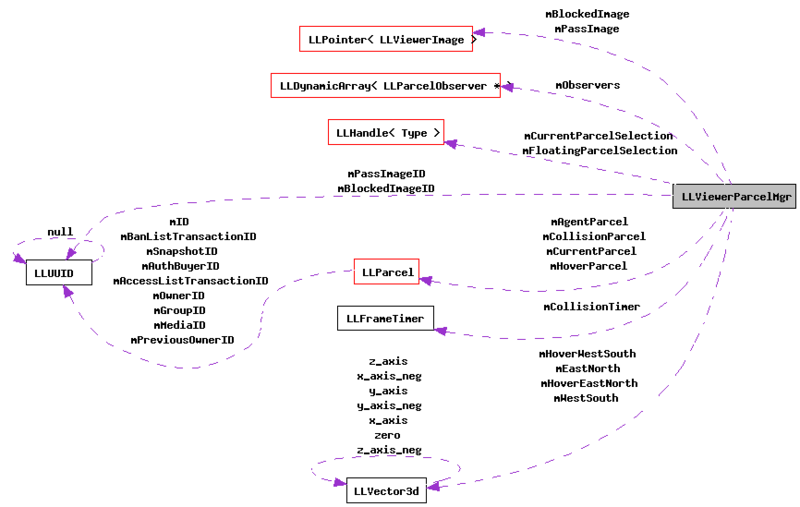 References mAgentParcel, mAgentParcelOverlay, mCollisionParcel, mCollisionSegments, mCurrentParcel, mCurrentParcelSelection, mFloatingParcelSelection, mHighlightSegments, mHoverParcel, NULL, and sPackedOverlay. Definition at line 618 of file llviewerparcelmgr.cpp. References mObservers, and LLDynamicArray< Type, BlockSize >::put(). Referenced by LLMenuParcelObserver::LLMenuParcelObserver(), LLPanelLandInfo::LLPanelLandInfo(), LLFloaterLand::show(), LLFloaterSellLandUI::soleInstance(), and LLFloaterBuyLandUI::soleInstance(). Definition at line 674 of file llviewerparcelmgr.cpp. References LLParcel::allowModifyBy(), gAgent, LLAgent::getGroupID(), LLAgent::getID(), LLAgent::isGodlike(), and mAgentParcel. Definition at line 694 of file llviewerparcelmgr.cpp. Definition at line 689 of file llviewerparcelmgr.cpp. Definition at line 699 of file llviewerparcelmgr.cpp. Definition at line 2438 of file llviewerparcelmgr.cpp. References _PREHASH_LocalID, _PREHASH_ParcelBuyPass, _PREHASH_ParcelData, LLMessageSystem::addS32Fast(), LLMessageSystem::addUUID(), gAgent, LLViewerRegion::getHost(), LLAgent::getID(), LLParcel::getLocalID(), getParcelSelection(), getSelectionRegion(), LLAgent::getSessionID(), gMessageSystem, LLMessageSystem::newMessageFast(), LLMessageSystem::nextBlock(), LLMessageSystem::nextBlockFast(), and LLMessageSystem::sendReliable(). Definition at line 2275 of file llviewerparcelmgr.cpp. References LLMessageSystem::addF32(), LLMessageSystem::addUUID(), LLViewerWindow::alertXml(), gAgent, LLViewerRegion::getHost(), LLAgent::getID(), LLViewerRegion::getPosRegionFromGlobal(), LLWorld::getRegionFromPosGlobal(), LLAgent::getSessionID(), gMessageSystem, gViewerWindow, gWorldp, LLVector3::mV, LLMessageSystem::newMessage(), LLMessageSystem::nextBlock(), LLMessageSystem::sendReliable(), VX, and VY. Definition at line 2333 of file llviewerparcelmgr.cpp. Definition at line 2206 of file llviewerparcelmgr.cpp. References gAgent, LLParcel::getAuthorizedBuyerID(), LLParcel::getForSale(), LLAgent::getGroupID(), LLAgent::getID(), LLParcel::getOwnerID(), LLParcel::getSalePrice(), GP_LAND_DEED, LLAgent::hasPowerInActiveGroup(), LLUUID::isNull(), LLParcel::isPublic(), mCurrentParcel, mRequestResult, mSelected, LLUUID::notNull(), PARCEL_RESULT_NO_DATA, and TRUE. Referenced by enable_buy_land(), LLWorldEnableBuyLand::handleEvent(), LLStatusBar::refresh(), and LLPanelLandGeneral::refresh(). Definition at line 756 of file llviewerparcelmgr.cpp. References FALSE, getAgentParcel(), LLParcel::getSoundLocal(), gParcelMgr, inAgentParcel(), isSoundLocal(), and TRUE. Referenced by process_sound_trigger(), LLVOAvatar::processSingleAnimationStateChange(), LLVOAvatar::updateCharacter(), and LLAudioSourceVO::updateGain(). Definition at line 2596 of file llviewerparcelmgr.cpp. References gParcelMgr, NULL, and sNullSelection. Definition at line 2133 of file llviewerparcelmgr.cpp. References LLParcel::getGroupID(), getParcelSelection(), gParcelMgr, and sendParcelDeed(). Definition at line 2108 of file llviewerparcelmgr.cpp. References LLViewerWindow::alertXml(), DB_FIRST_NAME_BUF_SIZE, deedAlertCB(), gCacheName, LLParcel::getArea(), LLParcel::getContributeWithDeed(), LLParcel::getGroupID(), LLCacheName::getGroupName(), LLCacheName::getName(), LLParcel::getOwnerID(), gViewerWindow, llformat(), MAX_STRING, mCurrentParcel, and NULL. Definition at line 1179 of file llviewerparcelmgr.cpp. Referenced by LLFloaterBuyLandUI::sendBuyLand(), and LLFloaterBuyLandUI::~LLFloaterBuyLandUI(). Definition at line 593 of file llviewerparcelmgr.cpp. References FALSE, LLParcel::mAccessList, LLParcel::mBanList, mCurrentParcel, mCurrentParcelSelection, mFloatingParcelSelection, mSelected, mSelectedDwell, notifyObservers(), NULL, and LLParcel::setLocalID(). Referenced by deselectUnused(), handle_go_to(), LLLandSit::handleEvent(), LLLandBuild::handleEvent(), LLObjectEdit::handleEvent(), LLToolSelectLand::handleMouseDown(), LLToolPie::pickAndShowMenu(), sendParcelRelease(), and LLAgent::teleportCore(). Definition at line 584 of file llviewerparcelmgr.cpp. References deselectLand(), mCurrentParcelSelection, and mFloatingParcelSelection. Definition at line 193 of file llviewerparcelmgr.cpp. References LLParcel::dump(), end, llendl, llinfos, mAgentParcel, LLParcel::mBanList, mCurrentParcel, mEastNorth, mHoverParcel, mSelected, mWestSouth, and S32. Definition at line 668 of file llviewerparcelmgr.cpp. Referenced by LLAgent::canFly(), canHearSound(), create_new_landmark(), enable_land_build(), enable_object_build(), LLAttachmentEnableDrop::handleEvent(), LLWorldEnableBuyLand::handleEvent(), LLWorldCreateLandmark::handleEvent(), LLAudioStreamMediaListener::handleEvent(), LLAudioStreamMusicListener::handleEvent(), LLPanelClassified::initNewClassified(), LLPanelPick::initNewPick(), LLOverlayBar::mediaPlay(), LLOverlayBar::musicPlay(), LLFloaterLandmark::onBtnNew(), LLPanelLandOptions::onClickSet(), LLStatusBar::refresh(), LLOverlayBar::refresh(), and LLVoiceClient::stateMachine(). Definition at line 1255 of file llviewerparcelmgr.cpp. Definition at line 823 of file llviewerparcelmgr.cpp. References mCollisionParcel, mRenderCollision, and NULL. Definition at line 223 of file llviewerparcelmgr.cpp. References FALSE, LLParcel::getClaimPricePerMeter(), LLParcel::getForSale(), LLParcel::getSalePrice(), getSelectedArea(), LLParcel::getTotalRent(), mCurrentParcel, mCurrentParcelSelection, mSelected, mSelectedDwell, S32, and TRUE. Referenced by LLPanelLandInfo::refresh(), and LLPanelLandGeneral::refresh(). Definition at line 133 of file llviewerparcelmgr.h. Definition at line 663 of file llviewerparcelmgr.cpp. Referenced by LLPanelLandOptions::draw(), LLPanelLandOptions::onClickPublishHelp(), LLFloaterTools::onOpen(), and LLFloaterLand::show(). Definition at line 810 of file llviewerparcelmgr.cpp. References mHoverParcel, mHoverRequestResult, NULL, and PARCEL_RESULT_SUCCESS. Definition at line 214 of file llviewerparcelmgr.h. References LLVector3d::mdV, mHoverEastNorth, mHoverWestSouth, and VY. Definition at line 211 of file llviewerparcelmgr.h. References LLVector3d::mdV, mHoverEastNorth, mHoverWestSouth, and VX. Definition at line 658 of file llviewerparcelmgr.cpp. Referenced by buyPass(), LLFloaterSellLandUI::SelectionObserver::changed(), LLFloaterBuyLandUI::SelectionObserver::changed(), deedAlertCB(), enable_buy_land(), LLPanelLandGeneral::enableBuyPass(), LLWorldEnableBuyLand::handleEvent(), LLFloaterAuction::initialize(), LLToolBrushLand::modifyLandInSelectionGlobal(), LLPanelLandInfo::onClickAbout(), LLPanelLandGeneral::onClickBuyPass(), reclaimParcel(), and LLPanelLandInfo::refresh(). Definition at line 268 of file llviewerparcelmgr.cpp. References LLParcel::getCleanOtherTime(), LLParcel::getGroupPrimCount(), LLParcel::getMaxPrimCapacity(), LLParcel::getOtherPrimCount(), LLParcel::getOwnerPrimCount(), LLParcel::getParcelPrimBonus(), LLParcel::getPrimCount(), LLParcel::getSelectedPrimCount(), LLParcel::getSimWideMaxPrimCapacity(), LLParcel::getSimWidePrimCount(), llround(), mCurrentParcel, and mSelected. Referenced by LLPanelLandObjects::onClickReturnGroupObjects(), LLPanelLandObjects::onClickReturnOtherObjects(), LLPanelLandObjects::onClickReturnOwnerList(), LLPanelLandObjects::onClickReturnOwnerObjects(), and LLPanelLandObjects::refresh(). Definition at line 285 of file llviewerparcelmgr.cpp. References LLParcel::getArea(), height, llround(), mCurrentParcel, mCurrentParcelSelection, LLVector3d::mdV, mEastNorth, mSelected, mWestSouth, S32, VX, VY, and width. Referenced by getDisplayInfo(), and LLPanelLandInfo::refresh(). Definition at line 131 of file llviewerparcelmgr.h. References mEastNorth, mWestSouth, and selectionEmpty(). Referenced by handle_claim_public_land(), and LLToolBrushLand::modifyLandInSelectionGlobal(). Definition at line 130 of file llviewerparcelmgr.h. References LLVector3d::mdV, mEastNorth, mWestSouth, and VY. Definition at line 215 of file llviewerparcelmgr.cpp. References LLWorld::getRegionFromPosGlobal(), gWorldp, mWestSouth, and NULL. Referenced by buyPass(), LLFloaterSellLandUI::SelectionObserver::changed(), LLFloaterBuyLandUI::SelectionObserver::changed(), LLPanelLandOptions::draw(), handle_claim_public_land(), LLFloaterAuction::initialize(), LLPanelLandOptions::onClickPublishHelp(), LLPanelLandObjects::onClickRefresh(), LLPanelLandOptions::onCommitAny(), reclaimParcel(), LLPanelLandInfo::refresh(), LLPanelLandCovenant::refresh(), LLPanelLandObjects::refresh(), LLPanelLandGeneral::refresh(), send_other_clean_time_message(), send_parcel_select_objects(), send_return_objects_message(), startBuyLand(), startSellLand(), LLFloaterBuyLandUI::updateCovenantInfo(), and LLFloaterBuyLandUI::updateParcelInfo(). Definition at line 129 of file llviewerparcelmgr.h. References LLVector3d::mdV, mEastNorth, mWestSouth, and VX. Definition at line 786 of file llviewerparcelmgr.cpp. References FALSE, gAgent, LLViewerRegion::getPosRegionFromGlobal(), LLAgent::getRegion(), LLWorld::getRegionFromPosGlobal(), gWorldp, mAgentParcelOverlay, mParcelsPerEdge, LLVector3::mV, PARCEL_GRID_STEP_METERS, S32, TRUE, VX, and VY. Definition at line 2457 of file llviewerparcelmgr.cpp. References BA_ALLOWED, BA_NOT_IN_GROUP, BA_NOT_ON_LIST, FALSE, mCollisionBanned, and TRUE. Referenced by LLPanelLandGeneral::enableBuyPass(), LLToolPie::pickAndShowMenu(), and LLPanelLandGeneral::refresh(). Definition at line 704 of file llviewerparcelmgr.cpp. References FALSE, LLViewerRegion::getParcelOverlay(), LLViewerRegion::getPosRegionFromGlobal(), LLWorld::getRegionFromPosGlobal(), gWorldp, and LLViewerParcelOverlay::isOwned(). Definition at line 730 of file llviewerparcelmgr.cpp. References FALSE, LLViewerRegion::getParcelOverlay(), LLViewerRegion::getPosRegionFromGlobal(), LLWorld::getRegionFromPosGlobal(), gWorldp, and LLViewerParcelOverlay::isOwnedOther(). Definition at line 717 of file llviewerparcelmgr.cpp. References FALSE, LLViewerRegion::getParcelOverlay(), LLViewerRegion::getPosRegionFromGlobal(), LLWorld::getRegionFromPosGlobal(), gWorldp, and LLViewerParcelOverlay::isOwnedSelf(). Definition at line 2499 of file llviewerparcelmgr.cpp. References FALSE, gAgent, LLAgent::getID(), LLParcel::getOwnerID(), LLParcel::getOwnershipStatus(), LLAgent::isGodlike(), isParcelOwnedByAgent(), and LLParcel::OS_LEASED. Referenced by LLPanelLandOptions::draw(), LLPanelLandOptions::onClickPublishHelp(), LLPanelLandBan::refresh(), LLPanelLandAccess::refresh(), LLPanelLandMedia::refresh(), LLPanelLandOptions::refresh(), LLPanelLandObjects::refresh(), and LLPanelLandGeneral::refresh(). Definition at line 2467 of file llviewerparcelmgr.cpp. References FALSE, gAgent, LLAgent::getID(), LLParcel::getOwnerID(), LLAgent::hasPowerInGroup(), LLAgent::isGodlike(), LLParcel::isPublic(), and TRUE. Referenced by LLAgent::canFly(), create_new_landmark(), LLWorldCreateLandmark::handleEvent(), isParcelModifiableByAgent(), LLFloaterLandmark::onBtnNew(), LLPanelLandInfo::refresh(), LLPanelLandGeneral::refresh(), and startReleaseLand(). Definition at line 743 of file llviewerparcelmgr.cpp. References FALSE, LLViewerRegion::getParcelOverlay(), LLViewerRegion::getPosRegionFromGlobal(), LLWorld::getRegionFromPosGlobal(), gWorldp, and LLViewerParcelOverlay::isSoundLocal(). Definition at line 633 of file llviewerparcelmgr.cpp. References LLParcelObserver::changed(), LLDynamicArray< Type, BlockSize >::count(), count, LLDynamicArray< Type, BlockSize >::get(), i, mObservers, LLDynamicArray< Type, BlockSize >::put(), and S32. Referenced by deselectLand(), processParcelAccessListReply(), processParcelDwellReply(), processParcelProperties(), selectCollisionParcel(), selectLand(), and set_god_level(). Definition at line 1912 of file llviewerparcelmgr.cpp. References _PREHASH_AgentID, _PREHASH_Data, _PREHASH_Flags, _PREHASH_LocalID, _PREHASH_SequenceID, AL_ACCESS, AL_BAN, LLParcel::getLocalID(), LLMessageSystem::getS32Fast(), LLMessageSystem::getU32Fast(), LLMessageSystem::getUUIDFast(), gParcelMgr, llendl, llwarns, LLParcel::mAccessList, LLParcel::mBanList, mCurrentParcel, notifyObservers(), S32, and LLParcel::unpackAccessEntries(). Definition at line 1952 of file llviewerparcelmgr.cpp. References LLMessageSystem::getF32(), LLParcel::getLocalID(), LLMessageSystem::getS32(), LLMessageSystem::getUUID(), gParcelMgr, mCurrentParcel, mSelectedDwell, notifyObservers(), and S32. Definition at line 1327 of file llviewerparcelmgr.cpp. References _PREHASH_Data, _PREHASH_ParcelData, _PREHASH_SequenceID, LLMessageSystem::getBinaryDataFast(), LLWorld::getRegion(), LLMessageSystem::getS32Fast(), LLMessageSystem::getSender(), LLMessageSystem::getSizeFast(), gNoRender, gParcelMgr, gWorldp, llendl, llwarns, LLViewerRegion::mParcelOverlay, mParcelsPerEdge, PARCEL_OVERLAY_CHUNKS, S32, sPackedOverlay, and LLViewerParcelOverlay::uncompressLandOverlay(). Definition at line 1370 of file llviewerparcelmgr.cpp. References _PREHASH_AABBMax, _PREHASH_AABBMin, _PREHASH_Area, _PREHASH_AuctionID, _PREHASH_Bitmap, _PREHASH_ClaimDate, _PREHASH_ClaimPrice, _PREHASH_GroupPrims, _PREHASH_IsGroupOwned, _PREHASH_LocalID, _PREHASH_MaxPrims, _PREHASH_OtherCount, _PREHASH_OtherPrims, _PREHASH_OwnerID, _PREHASH_OwnerPrims, _PREHASH_ParcelData, _PREHASH_ParcelPrimBonus, _PREHASH_PublicCount, _PREHASH_RegionDenyAnonymous, _PREHASH_RegionDenyIdentified, _PREHASH_RegionDenyTransacted, _PREHASH_RegionPushOverride, _PREHASH_RentPrice, _PREHASH_RequestResult, _PREHASH_SelectedPrims, _PREHASH_SelfCount, _PREHASH_SequenceID, _PREHASH_TotalPrims, AL_ACCESS, AL_BAN, BA_BANNED, BA_NOT_IN_GROUP, BA_NOT_ON_LIST, LLVector3d::clearVec(), COLLISION_BANNED_PARCEL_SEQ_ID, COLLISION_NOT_IN_GROUP_PARCEL_SEQ_ID, COLLISION_NOT_ON_LIST_PARCEL_SEQ_ID, FALSE, gAgent, gAudiop, LLMessageSystem::getBinaryDataFast(), LLControlGroup::getBOOL(), LLMessageSystem::getBOOL(), LLMessageSystem::getBOOLFast(), LLMessageSystem::getF32Fast(), LLViewerRegion::getHandle(), LLMediaEngine::getImageUUID(), LLMediaEngine::getInstance(), LLAudioEngine::getInternetStreamURL(), LLParcel::getLocalID(), LLMediaEngine::getMediaRenderer(), LLParcel::getMediaURL(), LLViewerRegion::getPosGlobalFromRegion(), LLViewerRegion::getPosRegionFromGlobal(), LLAgent::getRegion(), LLWorld::getRegion(), LLMessageSystem::getS32(), LLMessageSystem::getS32Fast(), LLMessageSystem::getSender(), LLMessageSystem::getU32Fast(), LLMessageSystem::getU8(), LLMediaEngine::getUrl(), LLMessageSystem::getUUIDFast(), LLMessageSystem::getVector3Fast(), LLControlGroup::getWarning(), gParcelMgr, gSavedSettings, gWorldp, HOVERED_PARCEL_SEQ_ID, LLParcel::init(), LLMediaEngine::isAutoScaled(), LLMediaBase::isLooping(), LLMediaBase::isPlaying(), llendl, llinfos, mAgentParcel, mAgentParcelSequenceID, mCollisionBanned, mCollisionParcel, mCollisionSegments, mCollisionTimer, mCurrentParcel, mCurrentParcelSelection, mEastNorth, mHighlightSegments, mHoverEastNorth, mHoverParcel, mHoverRequestResult, mHoverWestSouth, mMediaParcelId, mMediaRegionId, mParcelsPerEdge, mRenderCollision, mRequestResult, mSelected, mSelectedDwell, LLVector3::mV, mWestSouth, notifyObservers(), NULL, optionally_prepare_video(), optionally_start_music(), PARCEL_RESULT_MULTIPLE, PARCEL_RESULT_NO_DATA, PARCEL_RESULT_SUCCESS, LLFrameTimer::reset(), resetSegments(), S32, SELECTED_PARCEL_SEQ_ID, sendParcelAccessListRequest(), sendParcelDwellRequest(), LLParcel::setAABBMax(), LLParcel::setAABBMin(), LLParcel::setAuctionID(), LLParcel::setCleanOtherTime(), LLParcel::setGroupPrimCount(), LLParcel::setLocalID(), LLParcel::setMaxPrimCapacity(), LLParcel::setOtherPrimCount(), LLParcel::setOwnerPrimCount(), LLParcel::setOwnershipStatus(), LLParcel::setParcelPrimBonus(), LLParcel::setRegionDenyAnonymousOverride(), LLParcel::setRegionDenyIdentifiedOverride(), LLParcel::setRegionDenyTransactedOverride(), LLParcel::setRegionPushOverride(), LLParcel::setSelectedPrimCount(), LLParcel::setSimWideMaxPrimCapacity(), LLParcel::setSimWidePrimCount(), LLControlGroup::setWarning(), LLNotifyBox::showXml(), start_video(), LLAudioEngine::startInternetStream(), stop_video(), LLAudioEngine::stopInternetStream(), LLStringBase< char >::trim(), TRUE, LLParcel::unpackMessage(), VX, VY, writeAgentParcelFromBitmap(), writeHighlightSegments(), and writeSegmentsFromBitmap(). Definition at line 2409 of file llviewerparcelmgr.cpp. References LLMessageSystem::addS32(), LLMessageSystem::addUUID(), gAgent, LLViewerRegion::getHost(), LLAgent::getID(), LLParcel::getLocalID(), LLViewerRegion::getOwner(), LLParcel::getOwnerID(), getParcelSelection(), getSelectionRegion(), LLAgent::getSessionID(), gMessageSystem, gParcelMgr, LLMessageSystem::newMessage(), LLMessageSystem::nextBlock(), LLUUID::notNull(), and LLMessageSystem::sendReliable(). Definition at line 2429 of file llviewerparcelmgr.cpp. Definition at line 624 of file llviewerparcelmgr.cpp. References mObservers, and LLDynamicArray< Type, BlockSize >::removeObj(). Referenced by LLFloaterLand::onClose(), LLMenuParcelObserver::~LLMenuParcelObserver(), and LLPanelLandInfo::~LLPanelLandInfo(). Definition at line 839 of file llviewerparcelmgr.cpp. References LLWorld::getRegionFromPosGlobal(), gWorldp, mHighlightSegments, mRenderSelection, mSelected, mWestSouth, and renderHighlightSegments(). Definition at line 821 of file llglsandbox.cpp. References BA_BANNED, BA_NOT_ON_LIST, BAN_HEIGHT, LLViewerImage::bindTexture(), EAST_MASK, f, gAgent, LLAgent::getPositionAgent(), GL_NAME_PARCEL_WALL, glBegin, glColor4f, glColor4ubv, glEnd, gRenderForSelect, llclamp(), mBlockedImage, mCollisionBanned, mParcelsPerEdge, mPassImage, LLColor4U::mV, LLVector3::mV, NORTH_MASK, PARCEL_GRID_STEP_METERS, PARCEL_HEIGHT, renderOneSegment(), S32, SOUTH_MASK, VX, VY, WEST_MASK, x, and y. Definition at line 771 of file llglsandbox.cpp. References f, glBegin, glColor4f, glEnd, mParcelsPerEdge, PARCEL_GRID_STEP_METERS, PARCEL_POST_HEIGHT, renderOneSegment(), S32, SOUTH_MASK, WEST_MASK, x, and y. Definition at line 685 of file llglsandbox.cpp. References EAST_MASK, f, LLViewerRegion::getLand(), LLViewerRegion::getOriginAgent(), llmax(), LLVector3::mV, REGION_WIDTH_METERS, LLSurface::resolveHeightRegion(), SOUTH_MASK, VX, VY, WEST_MASK, and z.
Referenced by renderCollisionSegments(), and renderHighlightSegments(). Definition at line 853 of file llviewerparcelmgr.cpp. References FALSE, gAgent, LLFrameTimer::getElapsedTimeF32(), LLParcel::getParcelFlag(), LLAgent::getRegion(), mCollisionParcel, mCollisionSegments, mCollisionTimer, mRenderCollision, PARCEL_COLLISION_DRAW_SECS, PF_USE_PASS_LIST, and renderCollisionSegments(). Referenced by render_hud_elements(), and LLViewerWindow::renderSelections(). Definition at line 517 of file llglsandbox.cpp. References f, gAgent, LLAgent::getPosAgentFromGlobal(), glBegin, glColor4f, glEnd, gWorldp, LLVector3::mV, PARCEL_POST_HEIGHT, LLWorld::resolveLandHeightAgent(), LLUI::setLineWidth(), VX, and VY. Definition at line 1288 of file llviewerparcelmgr.cpp. References _PREHASH_AgentData, _PREHASH_AgentID, _PREHASH_East, _PREHASH_North, _PREHASH_ParcelData, _PREHASH_ParcelPropertiesRequest, _PREHASH_SequenceID, _PREHASH_SessionID, _PREHASH_South, _PREHASH_West, LLMessageSystem::addBOOL(), LLMessageSystem::addF32Fast(), LLMessageSystem::addS32Fast(), LLMessageSystem::addUUIDFast(), FALSE, gAgent, LLViewerRegion::getHost(), LLAgent::getID(), LLViewerRegion::getPosRegionFromGlobal(), LLWorld::getRegionFromPosGlobal(), LLAgent::getSessionID(), gMessageSystem, gWorldp, HOVERED_PARCEL_SEQ_ID, mHoverRequestResult, LLVector3::mV, LLMessageSystem::newMessageFast(), LLMessageSystem::nextBlockFast(), PARCEL_GRID_STEP_METERS, PARCEL_RESULT_NO_DATA, LLMessageSystem::sendReliable(), VX, and VY. Definition at line 302 of file llviewerparcelmgr.cpp. References count, i, mParcelsPerEdge, and S32. Referenced by LLViewerParcelMgr(), processParcelProperties(), selectCollisionParcel(), and selectLand(). Definition at line 451 of file llviewerparcelmgr.cpp. References _PREHASH_AgentID, _PREHASH_LocalID, _PREHASH_ParcelData, _PREHASH_ParcelPropertiesRequestByID, _PREHASH_SequenceID, _PREHASH_SessionID, LLMessageSystem::addS32Fast(), LLMessageSystem::addUUIDFast(), gAgent, LLParcel::getDesc(), LLAgent::getID(), LLParcel::getLocalID(), LLParcel::getName(), LLViewerRegion::getOriginGlobal(), LLParcel::getPassHours(), LLParcel::getPassPrice(), LLAgent::getRegion(), LLAgent::getSessionID(), gMessageSystem, gWorldp, mCollisionParcel, mCurrentParcel, mCurrentParcelSelection, mEastNorth, mFloatingParcelSelection, mHighlightSegments, mRequestResult, mSelected, mWestSouth, LLMessageSystem::newMessageFast(), LLMessageSystem::nextBlockFast(), notifyObservers(), NULL, PARCEL_GRID_STEP_METERS, PARCEL_RESULT_NO_DATA, resetSegments(), SELECTED_PARCEL_SEQ_ID, LLAgent::sendReliableMessage(), LLParcel::setDesc(), LLParcel::setName(), LLParcel::setPassHours(), LLParcel::setPassPrice(), and TRUE. Definition at line 652 of file llviewerparcelmgr.cpp. Referenced by LLFloaterSellLandUI::SelectionObserver::changed(), LLFloaterBuyLandUI::SelectionObserver::changed(), enable_land_selected(), getSelection(), LLWorldEnableBuyLand::handleEvent(), LLShowFloater::handleEvent(), LLToolBrushLand::modifyLandInSelectionGlobal(), and LLFloaterTools::updatePopup(). Definition at line 497 of file llviewerparcelmgr.cpp. References _PREHASH_AgentData, _PREHASH_AgentID, _PREHASH_East, _PREHASH_North, _PREHASH_ParcelData, _PREHASH_ParcelPropertiesRequest, _PREHASH_SequenceID, _PREHASH_SessionID, _PREHASH_South, _PREHASH_West, LLMessageSystem::addBOOL(), LLMessageSystem::addF32Fast(), LLMessageSystem::addS32Fast(), LLMessageSystem::addUUIDFast(), f, FALSE, gAgent, LLViewerRegion::getHost(), LLAgent::getID(), LLViewerRegion::getPosRegionFromGlobal(), LLWorld::getRegionFromPosGlobal(), getSelectionHeight(), getSelectionWidth(), LLAgent::getSessionID(), gMessageSystem, gWorldp, mCurrentParcel, mCurrentParcelSelection, LLVector3d::mdV, mEastNorth, mFloatingParcelSelection, mHighlightSegments, mRequestResult, mSelected, LLVector3::mV, mWestSouth, LLMessageSystem::newMessageFast(), LLMessageSystem::nextBlockFast(), notifyObservers(), NULL, PARCEL_RESULT_NO_DATA, resetSegments(), sanitize_corners(), SELECTED_PARCEL_SEQ_ID, LLMessageSystem::sendReliable(), LLNotifyBox::showXml(), TRUE, VX, and VY. Referenced by LLToolSelectLand::handleMouseUp(), LLPanelRegionTools::onSelectRegion(), selectParcelAt(), and selectParcelInRectangle(). Definition at line 426 of file llviewerparcelmgr.cpp. References llround(), LLVector3d::mdV, PARCEL_GRID_STEP_METERS, selectLand(), TRUE, VX, and VY. Referenced by LLToolSelectLand::handleDoubleClick(), LLLandEdit::handleEvent(), LLShowFloater::handleEvent(), onClickBuyLand(), onClickParcelInfo(), and LLToolPie::pickAndShowMenu(). Definition at line 445 of file llviewerparcelmgr.cpp. References mEastNorth, mWestSouth, selectLand(), and TRUE. Definition at line 870 of file llviewerparcelmgr.cpp. References _PREHASH_AgentData, _PREHASH_AgentID, _PREHASH_Data, _PREHASH_Flags, _PREHASH_ParcelAccessListRequest, _PREHASH_SequenceID, _PREHASH_SessionID, LLMessageSystem::addS32(), LLMessageSystem::addS32Fast(), LLMessageSystem::addU32Fast(), LLMessageSystem::addUUIDFast(), AL_ACCESS, AL_BAN, gAgent, LLViewerRegion::getHost(), LLAgent::getID(), LLParcel::getLocalID(), LLWorld::getRegionFromPosGlobal(), LLAgent::getSessionID(), gMessageSystem, gWorldp, LLParcel::mAccessList, LLParcel::mBanList, mCurrentParcel, mSelected, mWestSouth, LLMessageSystem::newMessageFast(), LLMessageSystem::nextBlockFast(), and LLMessageSystem::sendReliable(). Definition at line 1974 of file llviewerparcelmgr.cpp. References _PREHASH_AgentData, _PREHASH_AgentID, _PREHASH_Data, _PREHASH_Flags, _PREHASH_ID, _PREHASH_List, _PREHASH_LocalID, _PREHASH_ParcelAccessListUpdate, _PREHASH_Sections, _PREHASH_SequenceID, _PREHASH_SessionID, _PREHASH_Time, _PREHASH_TransactionID, LLMessageSystem::addS32(), LLMessageSystem::addS32Fast(), LLMessageSystem::addU32Fast(), LLMessageSystem::addUUIDFast(), AL_ACCESS, AL_BAN, count, end, FALSE, gAgent, LLUUID::generate(), LLMessageSystem::getCurrentSendTotal(), LLViewerRegion::getHost(), LLAgent::getID(), LLParcel::getLocalID(), LLWorld::getRegionFromPosGlobal(), LLAgent::getSessionID(), gMessageSystem, gWorldp, LLParcel::mAccessList, LLParcel::mBanList, mCurrentParcel, LLAccessEntry::mFlags, LLAccessEntry::mID, mSelected, LLAccessEntry::mTime, MTUBYTES, mWestSouth, LLMessageSystem::newMessageFast(), LLMessageSystem::nextBlockFast(), LLUUID::null, PARCEL_MAX_ENTRIES_PER_PACKET, S32, LLMessageSystem::sendReliable(), and TRUE. Referenced by LLPanelLandBan::addAvatar(), LLPanelLandAccess::addAvatar(), LLPanelLandBan::onClickRemove(), and LLPanelLandAccess::onClickRemove(). Definition at line 1145 of file llviewerparcelmgr.cpp. References LLMessageSystem::addBOOL(), LLMessageSystem::addF32(), LLMessageSystem::addS32(), LLMessageSystem::addUUID(), gMessageSystem, LLViewerParcelMgr::ParcelBuyInfo::mAgent, LLViewerParcelMgr::ParcelBuyInfo::mArea, LLViewerParcelMgr::ParcelBuyInfo::mEast, LLViewerParcelMgr::ParcelBuyInfo::mGroup, LLViewerParcelMgr::ParcelBuyInfo::mHost, LLViewerParcelMgr::ParcelBuyInfo::mIsClaim, LLViewerParcelMgr::ParcelBuyInfo::mIsGroupOwned, LLViewerParcelMgr::ParcelBuyInfo::mNorth, LLViewerParcelMgr::ParcelBuyInfo::mParcelID, LLViewerParcelMgr::ParcelBuyInfo::mPrice, LLViewerParcelMgr::ParcelBuyInfo::mRemoveContribution, LLViewerParcelMgr::ParcelBuyInfo::mSession, LLViewerParcelMgr::ParcelBuyInfo::mSouth, LLViewerParcelMgr::ParcelBuyInfo::mWest, LLMessageSystem::newMessage(), LLMessageSystem::nextBlock(), LLMessageSystem::sendReliable(), and TRUE. Definition at line 1185 of file llviewerparcelmgr.cpp. References LLMessageSystem::addS32(), LLMessageSystem::addUUID(), LLViewerWindow::alertXml(), gAgent, LLViewerRegion::getHost(), LLAgent::getID(), LLParcel::getLocalID(), LLWorld::getRegionFromPosGlobal(), LLAgent::getSessionID(), gMessageSystem, gViewerWindow, gWorldp, LLUUID::isNull(), mCurrentParcel, mSelected, mWestSouth, LLMessageSystem::newMessage(), LLMessageSystem::nextBlock(), and LLMessageSystem::sendReliable(). Definition at line 905 of file llviewerparcelmgr.cpp. References LLMessageSystem::addS32(), LLMessageSystem::addUUID(), gAgent, LLViewerRegion::getHost(), LLAgent::getID(), LLParcel::getLocalID(), LLWorld::getRegionFromPosGlobal(), LLAgent::getSessionID(), gMessageSystem, gWorldp, mCurrentParcel, mSelected, mWestSouth, LLMessageSystem::newMessage(), LLMessageSystem::nextBlock(), LLUUID::null, and LLMessageSystem::sendReliable(). Definition at line 929 of file llviewerparcelmgr.cpp. References LLViewerWindow::alertXml(), callback_god_force_owner(), LLParcel::getAuctionID(), LLViewerRegion::getHost(), LLParcel::getLocalID(), LLViewerRegion::getOriginGlobal(), LLWorld::getRegionFromPosGlobal(), gViewerWindow, gWorldp, llendl, llinfos, mCurrentParcel, LLVector3d::mdV, mEastNorth, mSelected, mWestSouth, VX, and VY. Definition at line 993 of file llviewerparcelmgr.cpp. References LLMessageSystem::addS32(), LLMessageSystem::addUUID(), LLViewerWindow::alertXml(), gAgent, LLViewerRegion::getHost(), LLAgent::getID(), LLParcel::getLocalID(), LLWorld::getRegionFromPosGlobal(), LLAgent::getSessionID(), gMessageSystem, gViewerWindow, gWorldp, mCurrentParcel, mSelected, mWestSouth, LLMessageSystem::newMessage(), LLMessageSystem::nextBlock(), and LLMessageSystem::sendReliable(). Definition at line 1261 of file llviewerparcelmgr.cpp. References _PREHASH_AgentData, _PREHASH_AgentID, _PREHASH_LocalID, _PREHASH_ParcelData, _PREHASH_ParcelPropertiesUpdate, _PREHASH_SessionID, LLMessageSystem::addS32Fast(), LLMessageSystem::addU32(), LLMessageSystem::addUUIDFast(), gAgent, LLViewerRegion::getHost(), LLAgent::getID(), LLParcel::getLocalID(), LLWorld::getRegionFromPosGlobal(), LLAgent::getSessionID(), gMessageSystem, gWorldp, mWestSouth, LLMessageSystem::newMessageFast(), LLMessageSystem::nextBlockFast(), LLParcel::packMessage(), and LLMessageSystem::sendReliable(). Referenced by LLPanelLandObjects::callbackReturnGroupObjects(), LLPanelLandObjects::callbackReturnOtherObjects(), LLPanelLandObjects::callbackReturnOwnerList(), LLPanelLandObjects::callbackReturnOwnerObjects(), LLPanelLandOptions::onClickClear(), LLPanelLandOptions::onClickSet(), LLPanelLandGeneral::onClickStopSellLand(), LLPanelLandBan::onCommitAny(), LLPanelLandAccess::onCommitAny(), LLPanelLandMedia::onCommitAny(), LLPanelLandOptions::onCommitAny(), LLPanelLandGeneral::onCommitAny(), LLFloaterSellLandUI::onConfirmSale(), and LLPanelLandGeneral::setGroup(). Definition at line 1017 of file llviewerparcelmgr.cpp. References LLMessageSystem::addS32(), LLMessageSystem::addUUID(), LLViewerWindow::alertXml(), deselectLand(), gAgent, LLViewerRegion::getHost(), LLAgent::getID(), LLParcel::getLocalID(), LLWorld::getRegionFromPosGlobal(), LLAgent::getSessionID(), gMessageSystem, gViewerWindow, gWorldp, mCurrentParcel, mSelected, mWestSouth, LLMessageSystem::newMessage(), LLMessageSystem::nextBlock(), and LLMessageSystem::sendReliable(). Definition at line 175 of file llviewerparcelmgr.h. Referenced by LLToolBrushLand::handleDeselect(), LLToolBrushLand::handleMouseDown(), and LLToolBrushLand::handleMouseUp(). Definition at line 1073 of file llviewerparcelmgr.cpp. References LLViewerWindow::alertXml(), LLParcel::getArea(), LLViewerRegion::getHost(), LLParcel::getLocalID(), LLViewerRegion::getOriginGlobal(), LLViewerRegion::getPosRegionFromGlobal(), LLWorld::getRegionFromPosGlobal(), LLParcel::getSalePrice(), gViewerWindow, gWorldp, llendl, llinfos, LLViewerParcelMgr::ParcelBuyInfo::mAgent, LLViewerParcelMgr::ParcelBuyInfo::mArea, mCurrentParcel, LLVector3d::mdV, LLViewerParcelMgr::ParcelBuyInfo::mEast, mEastNorth, LLViewerParcelMgr::ParcelBuyInfo::mGroup, LLViewerParcelMgr::ParcelBuyInfo::mHost, LLViewerParcelMgr::ParcelBuyInfo::mIsClaim, LLViewerParcelMgr::ParcelBuyInfo::mIsGroupOwned, LLViewerParcelMgr::ParcelBuyInfo::mNorth, LLViewerParcelMgr::ParcelBuyInfo::mParcelID, LLViewerParcelMgr::ParcelBuyInfo::mPrice, LLViewerParcelMgr::ParcelBuyInfo::mRemoveContribution, mSelected, LLViewerParcelMgr::ParcelBuyInfo::mSession, LLViewerParcelMgr::ParcelBuyInfo::mSouth, LLVector3::mV, LLViewerParcelMgr::ParcelBuyInfo::mWest, mWestSouth, NULL, VX, and VY. Definition at line 2245 of file llviewerparcelmgr.cpp. References LLFloaterBuyLand::buyLand(), getSelectionRegion(), mCurrentParcelSelection, and TRUE. Referenced by LLShowFloater::handleEvent(), onClickBuyLand(), LLPanelLandGeneral::onClickBuyLand(), and LLPanelLandInfo::onClickClaim(). Definition at line 2365 of file llviewerparcelmgr.cpp. References LLViewerWindow::alertXml(), deedLandToGroup(), LLWorld::getRegionFromPosGlobal(), gViewerWindow, gWorldp, mCurrentParcel, mEastNorth, mRequestResult, mSelected, mWestSouth, PARCEL_RESULT_MULTIPLE, and PARCEL_RESULT_NO_DATA. Definition at line 2255 of file llviewerparcelmgr.cpp. References LLViewerWindow::alertXml(), callbackDivideLand(), gViewerWindow, mCurrentParcelSelection, and mSelected. Definition at line 2307 of file llviewerparcelmgr.cpp. References LLViewerWindow::alertXml(), callbackJoinLand(), gViewerWindow, mCurrentParcelSelection, and mSelected. Definition at line 2148 of file llviewerparcelmgr.cpp. References LLViewerWindow::alertXml(), LLAgent::canManageEstate(), gAgent, LLParcel::getArea(), LLWorld::getRegionFromPosGlobal(), GP_LAND_RELEASE, gViewerWindow, gWorldp, isParcelOwnedByAgent(), llformat(), mCurrentParcel, mCurrentParcelSelection, mEastNorth, mRequestResult, mSelected, mWestSouth, PARCEL_RESULT_MULTIPLE, PARCEL_RESULT_NO_DATA, and releaseAlertCB(). Referenced by LLPanelLandInfo::onClickRelease(), and LLPanelLandGeneral::onClickRelease(). Definition at line 2250 of file llviewerparcelmgr.cpp. References getSelectionRegion(), mCurrentParcelSelection, and LLFloaterSellLand::sellLand(). Definition at line 393 of file llviewerparcelmgr.cpp. References mAgentParcelOverlay, mParcelsPerEdge, S32, x, and y. Definition at line 313 of file llviewerparcelmgr.cpp. References llround(), mHighlightSegments, mParcelsPerEdge, PARCEL_GRID_STEP_METERS, S32, SOUTH_MASK, WEST_MASK, x, and y. Definition at line 357 of file llviewerparcelmgr.cpp. References mParcelsPerEdge, S32, SOUTH_MASK, WEST_MASK, x, and y. Definition at line 339 of file llviewerparcelmgr.h. Referenced by agentCanBuild(), agentCanTakeDamage(), dump(), getAgentParcel(), getAgentParcelName(), LLViewerParcelMgr(), processParcelProperties(), and ~LLViewerParcelMgr(). Definition at line 356 of file llviewerparcelmgr.h. Referenced by inAgentParcel(), LLViewerParcelMgr(), writeAgentParcelFromBitmap(), and ~LLViewerParcelMgr(). Definition at line 340 of file llviewerparcelmgr.h. Definition at line 372 of file llviewerparcelmgr.h. Referenced by LLViewerParcelMgr(), and renderCollisionSegments(). Definition at line 370 of file llviewerparcelmgr.h. Definition at line 368 of file llviewerparcelmgr.h. Referenced by isCollisionBanned(), processParcelProperties(), and renderCollisionSegments(). Definition at line 364 of file llviewerparcelmgr.h. Referenced by getCollisionParcel(), LLViewerParcelMgr(), processParcelProperties(), renderParcelCollision(), selectCollisionParcel(), and ~LLViewerParcelMgr(). Definition at line 365 of file llviewerparcelmgr.h. Referenced by LLViewerParcelMgr(), processParcelProperties(), renderParcelCollision(), and ~LLViewerParcelMgr(). Definition at line 369 of file llviewerparcelmgr.h. Referenced by processParcelProperties(), and renderParcelCollision(). Definition at line 331 of file llviewerparcelmgr.h. Referenced by canAgentBuyParcel(), deedLandToGroup(), deselectLand(), dump(), getDisplayInfo(), getPrimInfo(), getSelectedArea(), LLViewerParcelMgr(), processParcelAccessListReply(), processParcelDwellReply(), processParcelProperties(), selectCollisionParcel(), selectLand(), sendParcelAccessListRequest(), sendParcelAccessListUpdate(), sendParcelDeed(), sendParcelDwellRequest(), sendParcelGodForceOwner(), sendParcelGodForceToContent(), sendParcelRelease(), setupParcelBuy(), startDeedLandToGroup(), startReleaseLand(), and ~LLViewerParcelMgr(). Definition at line 332 of file llviewerparcelmgr.h. Referenced by deselectLand(), deselectUnused(), getDisplayInfo(), getParcelSelection(), getSelectedArea(), LLViewerParcelMgr(), processParcelProperties(), selectCollisionParcel(), selectLand(), startBuyLand(), startDivideLand(), startJoinLand(), startReleaseLand(), startSellLand(), and ~LLViewerParcelMgr(). Definition at line 336 of file llviewerparcelmgr.h. Referenced by dump(), getSelectedArea(), getSelection(), getSelectionHeight(), getSelectionWidth(), processParcelProperties(), selectCollisionParcel(), selectLand(), selectParcelInRectangle(), sendParcelGodForceOwner(), setupParcelBuy(), startDeedLandToGroup(), and startReleaseLand(). Definition at line 333 of file llviewerparcelmgr.h. Referenced by deselectLand(), deselectUnused(), getFloatingParcelSelection(), LLViewerParcelMgr(), selectCollisionParcel(), selectLand(), and ~LLViewerParcelMgr(). Definition at line 355 of file llviewerparcelmgr.h. Referenced by LLViewerParcelMgr(), processParcelProperties(), render(), selectCollisionParcel(), selectLand(), writeHighlightSegments(), and ~LLViewerParcelMgr(). Definition at line 345 of file llviewerparcelmgr.h. Referenced by getHoverParcelHeight(), getHoverParcelWidth(), and processParcelProperties(). Definition at line 342 of file llviewerparcelmgr.h. Referenced by dump(), getHoverParcel(), LLViewerParcelMgr(), processParcelProperties(), and ~LLViewerParcelMgr(). Definition at line 343 of file llviewerparcelmgr.h. Referenced by getHoverParcel(), processParcelProperties(), and requestHoverParcelProperties(). Definition at line 344 of file llviewerparcelmgr.h. Definition at line 376 of file llviewerparcelmgr.h. Definition at line 377 of file llviewerparcelmgr.h. Definition at line 347 of file llviewerparcelmgr.h. Referenced by addObserver(), notifyObservers(), and removeObserver(). Definition at line 354 of file llviewerparcelmgr.h. Referenced by inAgentParcel(), LLViewerParcelMgr(), processParcelOverlay(), processParcelProperties(), renderCollisionSegments(), renderHighlightSegments(), resetSegments(), writeAgentParcelFromBitmap(), writeHighlightSegments(), and writeSegmentsFromBitmap(). Definition at line 373 of file llviewerparcelmgr.h. Definition at line 371 of file llviewerparcelmgr.h. Definition at line 366 of file llviewerparcelmgr.h. Referenced by getCollisionParcel(), processParcelProperties(), and renderParcelCollision(). Definition at line 367 of file llviewerparcelmgr.h. Referenced by render(), and setSelectionVisible(). Definition at line 334 of file llviewerparcelmgr.h. Referenced by canAgentBuyParcel(), processParcelProperties(), selectCollisionParcel(), selectLand(), startDeedLandToGroup(), and startReleaseLand(). Definition at line 329 of file llviewerparcelmgr.h. Referenced by canAgentBuyParcel(), deselectLand(), dump(), getDisplayInfo(), getPrimInfo(), getSelectedArea(), processParcelProperties(), render(), selectCollisionParcel(), selectionEmpty(), selectLand(), sendParcelAccessListRequest(), sendParcelAccessListUpdate(), sendParcelDeed(), sendParcelDwellRequest(), sendParcelGodForceOwner(), sendParcelGodForceToContent(), sendParcelRelease(), setupParcelBuy(), startDeedLandToGroup(), startDivideLand(), startJoinLand(), and startReleaseLand(). Definition at line 337 of file llviewerparcelmgr.h. Referenced by deselectLand(), getDisplayInfo(), getDwelling(), processParcelDwellReply(), and processParcelProperties(). Definition at line 335 of file llviewerparcelmgr.h. Referenced by dump(), getSelectedArea(), getSelection(), getSelectionHeight(), getSelectionRegion(), getSelectionWidth(), processParcelProperties(), render(), selectCollisionParcel(), selectLand(), selectParcelInRectangle(), sendParcelAccessListRequest(), sendParcelAccessListUpdate(), sendParcelDeed(), sendParcelDwellRequest(), sendParcelGodForceOwner(), sendParcelGodForceToContent(), sendParcelPropertiesUpdate(), sendParcelRelease(), setupParcelBuy(), startDeedLandToGroup(), and startReleaseLand(). Definition at line 360 of file llviewerparcelmgr.h. Referenced by LLViewerParcelMgr(), processParcelOverlay(), and ~LLViewerParcelMgr().